"My mom made these salmon patties all year! They were a favorite of all us kids and the neighbors too." Mix both amounts of salmon, crushed crackers, eggs, mayonnaise, Worcestershire sauce, lemon juice, red pepper flakes, and dry mustard together in a bowl. Chill in refrigerator to allow flavors to combine, 30 minutes. Form mixture into 6 patties. Heat vegetable oil in a skillet over medium heat; fry the salmon patties until golden brown, about 4 minutes per side. 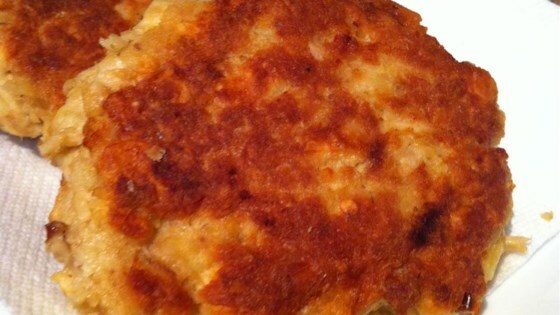 See how to make simple cracker crumb-breaded salmon patties. Refrigerating is optional before you cook them. I like to let the flavors meld in a little before I cook them. Yum! These have a fresh, wonderful flavor, my family loved them. I did add a light outer coating of crushed saltines before frying, probably not necessary. These are delicious but I think I'll add one egg to the mix to help it stay together. I also used panko bread crumbs instead of saltines, it added to the crunch including coatin g them in pankos. Excellent; moist; I am a beginning cook in the kitchen and the family loved them. Thank you! These were delicious! I made a little white sauce to put on top Thanks for sharing!